Want to eat great burgers in Goa? Look no further: This is a healthy burger joint in north Goa, with freshly-made patties, so you get the real burger experience whilst on a Goa getaway. The first outlet started in Anjuna in 2012. It was a tiny little place with some great art on the walls and awesome hospitality. People would come after roaming about town and stop by to munch on some yummy burgers with gigantic fries. The beef burgers were delectable and chicken a second close. 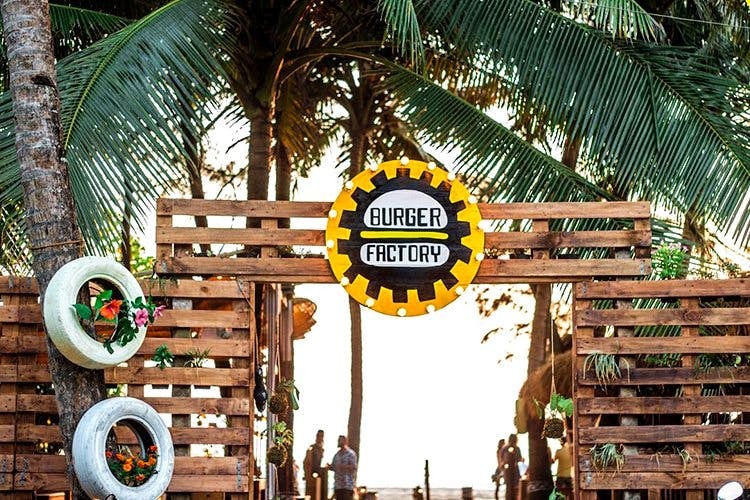 The small space started picking up crowds and today Burger Factory stands proud with an extended outlet at Anjuna and a full blown restaurant at Morjin. Mayank Dube, the owner, and a Delhiite at heart, began his burger making spree four years ago. He makes his own patties from scratch and has worked in and consulted restaurants in New Zealand and India for over a decade. He believes in slow food and innovation, and that’s what brought out his love for burgers and his dream of making the best burgers in Goa. We tried their famous artisanal beef burgers, a hallmark gourmet burger in Goa. With Cheddar, onion, tomato, bacon, feta, more Cheddar, bbq sauce, olive Oil, Racula Mango, avacado, bacon and green chilli, this burger was heavenly and SO filling! The new menu has sliders and some fresh snacks to feast on. Burger Factory at Morjim opened not too long ago, and boy is it special. Situated right next to the Morjim beach it has a kickass bar and a beautiful sunset to go with it. Try their cocktails, like Gin Basil Pineapple Crush or The Morjim’s New York Sour. They go perfectly well with a plate of sliders. Check them out on Facebook too.